This document is provided to document the marriage of my earliest known Watkins ancestors, James and Anne White Watkins. I was fortunate to find the hand-written texts you will see below on Ancestry.COM. James and Anne were early Virginia Quakers. The Quaker Community was organized around a hierarchy of different meetings. During American Colonial years, the Society of Friends had a meeting structure that facilitated the support of the religion in the far-flung communities in which they were located. The Particular Meeting was a small weekly meeting primarily to provide a place of religious activity held often in the home of a member or elder of the group so that attendees did not have to travel far from their homes to attend. Additionally, there were monthly meetings held more centrally such as in a specific site convenient for representatives of the society from several Particular Meetings to meet and discuss the business of the organization. Both James and Anne were active participants in the Society of Friends and belonged to the Black Water or Blackwater Monthly Meeting located originally in Surry County, Virginia but when that county divided in 1754, this meeting was then in the newly created Sussex County. In later years they were elders who held Particular Meetings in their home. 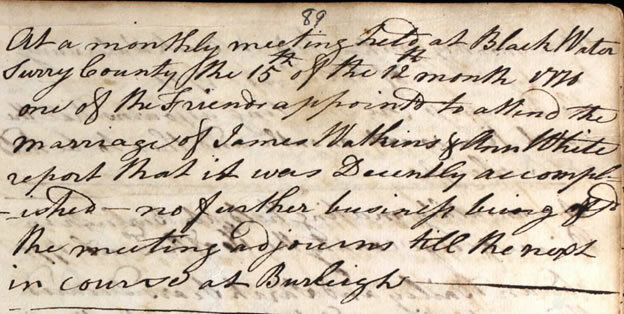 The purpose of this document is to show the documentation supporting the marriage of James Watkins, Sr. of Surry/Sussex County, Virginia and his wife Anne White, daughter of Benjamin White and Lucy Hancock White. As members of the Society of Friends, James and Anne had to declare their intentions of their proposed wedding twice with the Quaker Community of which they were a part, the Blackwater Meeting of Surry/Sussex County, Virginia. Following is documentation which I was fortunate to find on Ancestry.COM that documents this process.